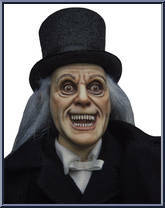 This 12 inch figure has over 20 points of articulation and features the likeness of Lon Chaney as The Vampire from the lost movie London After Midnight. It comes with Highly detailed outfit, a top hat, Lantern and stone textured foot base. This toy contains sharp points and small parts and is recommended for ages 5 and up. Contribute pictures, update details or suggest corrections for London After Midnight (Lon Chaney). Write a review about London After Midnight (Lon Chaney).